This location in NYC’s Central Park has got to be one of my favorite locations anywhere. I first came to this location when I was attending a workshop of one of world’s most renowned wedding photographers...one who I consider to be , if not THE best, than certainly one of the best wedding photographers working in the world today. What I learned at this workshop has allowed me to create wonderful wedding pictures anywhere, any time of day. This image was taken in bright mid-day sunlight; a time when most photographers go running for simpler, more easily-manageable conditions. Many photographers will shy away from taking pictures outdoors on a bright sunny day because they don’t have the skills and equipment necessary to deal with the less-than-desirable lighting conditions offered. My mission is to create the type of images my clients want at the locations they want to be photographed at; and fulfilling their wishes entails having a thorough knowledge of photographic lighting and post-production techniques to make their desires and my artistic visions come to fruition. 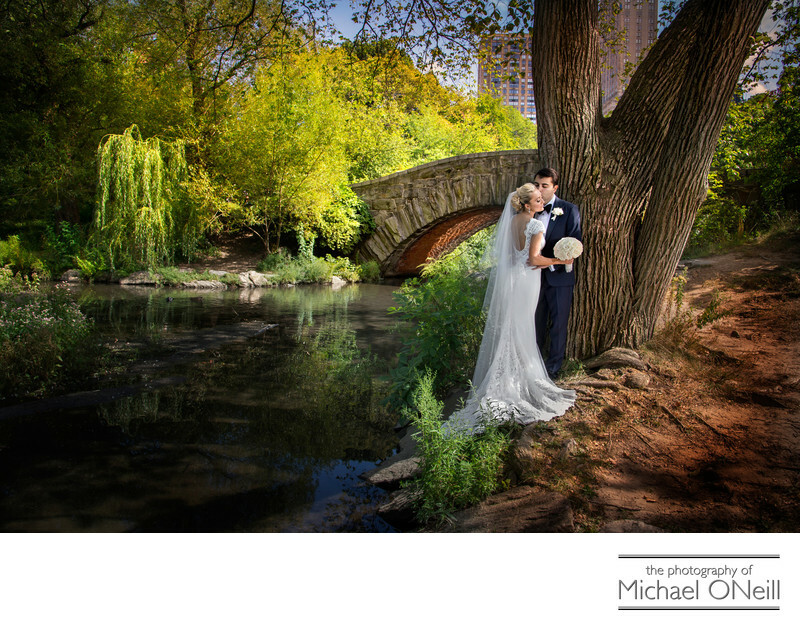 This photograph was taken in front of Gapstow Bridge, located in the southeast section of Central Park, just a few minutes walk from both The Parklane & The Plaza Hotels in New York City. If you are planning an elegant wedding at either of these two legendary venues you owe it to yourself to call me...the photographer that will meet and exceed all of your expectations for phenomenal wedding pictures.